Letter to support a visa application by employer. Visa recommendation letter sample by employer. Visa recommendation letter for employee. Visa recommendation letter from chamber of commerce. It is to certify that Mr. Nouman Zaib s\o Aurang Zaib has been an esteemed employee in our company namely Alliance Group Lahore since 5 January. During his services, we have found Mr. Zaib to be punctual, respectful and regular. The nature of his job has been assisting the administration team which he has done up to the mark. I have worked with Mr. Zaib as an administrative head. He has been very peaceful and beneficial for us. Moreover, Mr. Zaib is very one of the best candidate for our company. He has proven to be our asset over the whole year. The kind of professional he is, contributing to the progress of our company\institution. The best ability of Zaib is that he is a hard-working skilled professional. Therefore, I strongly refer him to gaining the opportunity which he desires for. This is to certify that Muhammad Ali, holding Identification Number _________, has been working at HIGH-TECH Communication since past 6 years. His date of birth is _______. I, as the manager of this office, assure you that Ali has never been involved in any sort of criminal activity and has never shown any sort of violent behavior. He has been punctual from the very beginning and always worked with focus and goodwill. Getting tangled up in fights and irrational arguments has never been his thing. He likes to keep things to himself and focus on tasks in front of him. Further he is quite well off so he surely will not have any problem regarding fulfillment of his financial needs. I can guarantee you that if he goes to Canada, he would not cause any trouble and will fulfill all the conditions put in front of him. I have attached his joining letter and salary history as per his request. For any further queries or confusions feel free to contact me, I would gladly assist you. It is my pleasure to write recommendation for Mr. Naveed S/O Mr. JJJ, passport number ———-. He is working with us as an Assistant Manager from 20XX till now. We are impressed by his outstanding performance and energetic personality. He is absolutely good in his work and he knows how to improve a company and how to meet its need. I am glad that he is in my team. His good personality and smiling face is a success of company. I wish him all the best in all the way. Sample letter to employee for improving educational skills and capabilities for the betterment of his career growth or promotion in the company. I am writing this letter to appreciate your hard work. You are an extremely talented and committed individual and you have every trait necessary for a successful career. The only restraint factor is that you do not have a university degree which is extremely important for career growth. If you do not complete your education your promotion will be restricted as we have a policy of promoting those who have experience as well as education. Intermediate diploma is not enough for career growth in the long run. Therefore, I advise you to complete your education formally or else take admission in distant learning programs offered by various universities. I assure you that a bright future awaits you upon completion of your education. I am writing this letter to inform you that the school has changed its policy and know we are hiring new staff with at least master’s degree, as you have been with us from last 15 years and we respect your services, I would like to ask you to upgrade your degree from BS to masters as we want you to be a part of our school. I hope you will consider this letter and will take action otherwise school will hire someone else. Thanks. Sample letter to inform employer that you are not willing to join the job opportunity offered to your after the interview due to salary, benefits, terms, timing and for any other reason. Reference to your offer regarding manager’s job in Nestle Pvt. Ltd, I want to apologize that I can’t accept this offer. When I approached your company for this job I had misunderstanding about certain things. Now I have realized that some of your terms and conditions are not suitable to me. I thank you for giving me this opportunity, but I am extremely sorry that I won’t be able to join you. Hope you don’t take it personally and accept it with an open mind. I am grateful to your company to offer me the job of assistant manager. It would be an honor to work in an organization like yours, but I am sorry to tell you that I had received an offer from another company to which I have assented too. If I had received your offer a little earlier I might had changed my decision. I again apologize for this inconvenience. You are always welcome for any other service you require from me. It was a great pleasure to receive a job offer from your company. However, I am sorry to inform you that I am rejecting that offer due to personal reasons. I appreciate your offer and respect your company a lot. However, due to some circumstances I cannot join your company. Please accept my refusal. I will contact you again if it becomes possible for me to accept this offer later on. 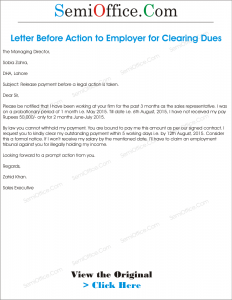 Sample letter of action to employment tribunal for registering FIR against the employer due to non payment of salary, commission, dues, incentive or monthly pay. Please be notified that I have been working at your firm for the past 3 months as the sales representative. I was on a probationary period of 1 month i.e. May 2015. Till date i.e. 6th August, 2015, I have not received my pay Rupees 50,000/- only for 2 months June-July 2015. By law you cannot withhold my payment. You are bound to pay me this amount as per our signed contract. 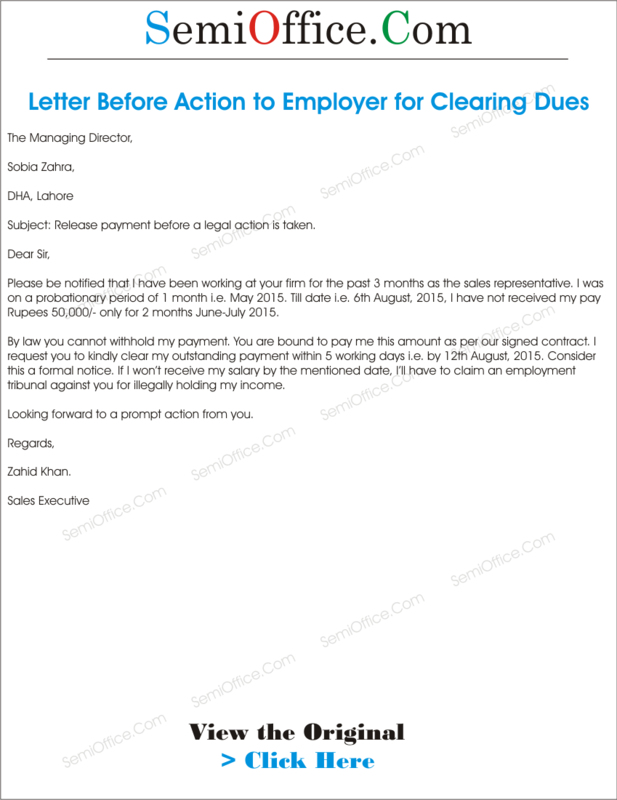 I request you to kindly clear my outstanding payment within 5 working days i.e. by 12th August, 2015. Consider this a formal notice. If I won’t receive my salary by the mentioned date, I’ll have to claim an employment tribunal against you for illegally holding my income.